I always love sitting down to read the year in review posts, and writing them has a cathartic feeling that I look forward to. Alot has happen over the past twelve months since I last convened at my desk with a mug of hot tea and mulled over the events of the year. 2017 has been a brilliant year for me professionally, with many projects and long dreamt plans finally coming to fruition. 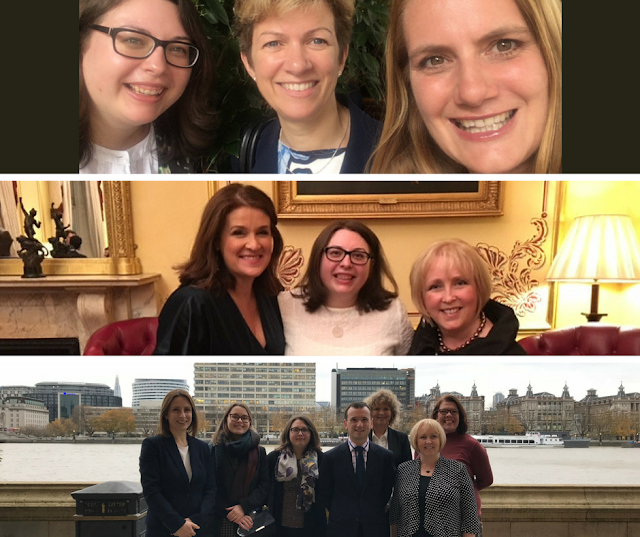 I've managed an election campaign, expanded my work in the political field and am working with amazing organisations championing women in politics. I've ticked off a life long dream of being on the radio, contributing to election coverage as well as regularly appearing on two of the main radio shows in Wales. I've worked with clients in new professional fields, and made many new contacts who have transformed the way I think and do business. I've also been present at some of the year's memorable events. The Trump Inauguration in January was one I won't forget in a long time, as was the Women's March and working on the GE 2017 election campaign. 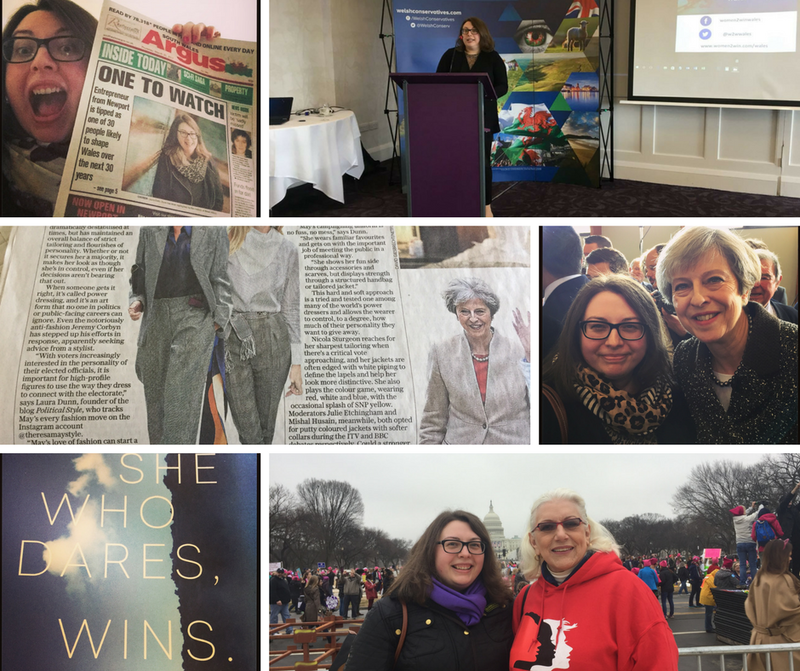 Other highlights include meeting the Prime Minister, Theresa May and seeing her awesome shoes in real life! But perhaps most of all, the highlight of 2017 has been, for the first time, feeling comfortable with who I am working with and feeling part of a tribe that truly fits. Finding friends amongst 2017's journey has been wonderful, and is just one of the things I am grateful that this rollercoaster year brought. And with new friends and new challenges come the inevitable 'retirement' of others. Some friendships have come to an end due to professional reasons- never ever fail to be surprised by the judgement and actions of others! And as I look to 2018, I hope this new year will be as successful as the one we are seeing out. 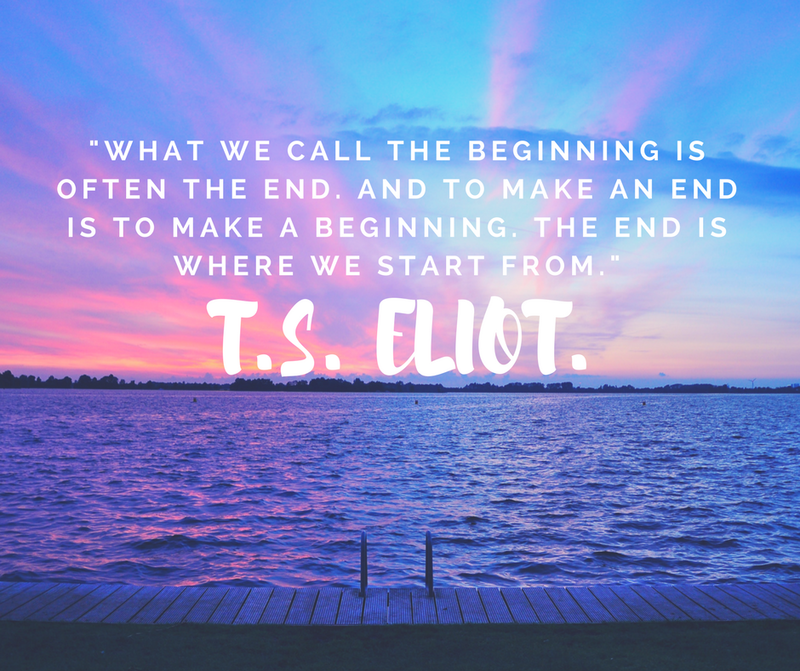 I have big hopes and dreams for new projects, new workstreams and new relationships. 2018 will be a landmark year in many ways- I turn the big 3-0, we celebrate the anniversary of women's suffrage in the UK and our country will face many big changes. But this is what a new year is all about - new challenges, new opportunities and a fresh change to make a difference. Bring it! 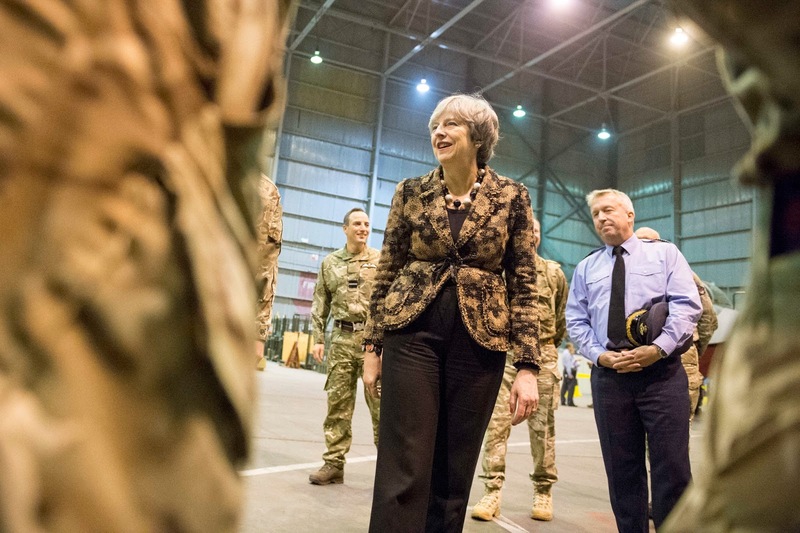 2017 has been a year of change for many reasons, but one thing remains constant - Theresa May's fabulously fashionable wardrobe. This year has probably been one that the PM won't forget, and despite the ups and downs, Theresa's sense of style and commitment to British fashion has remained constant. 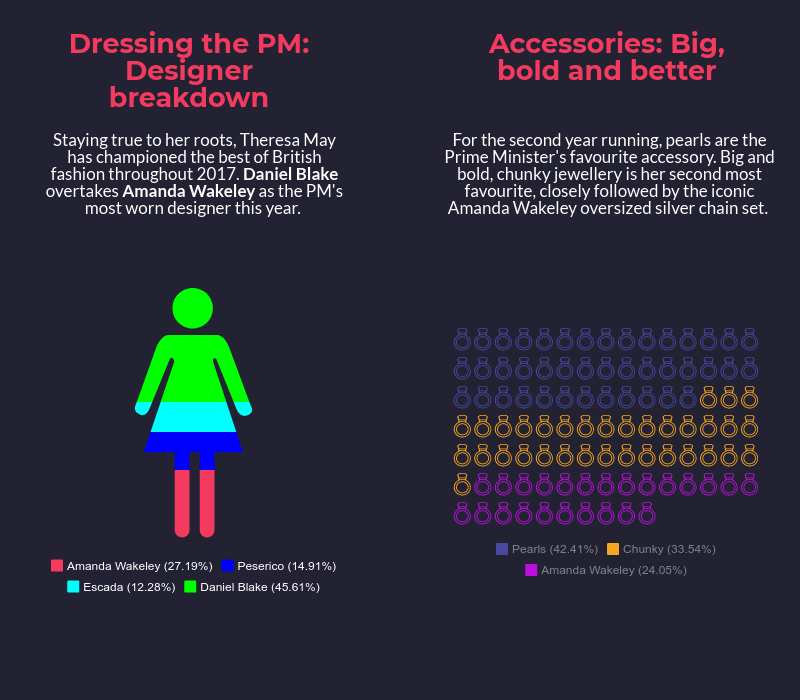 Eagle eyed readers will remember the infographic I produced last year, detailing Theresa May's clothes choices during the first six months as Prime Minister. 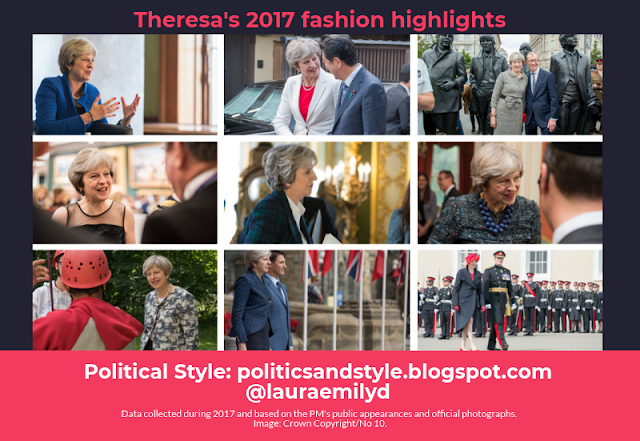 We've had a full year of gorgeous clothes to pore over, so here's the low-down of what Theresa May has worn during 2017. Focusing on public appearances and official photographs, I've put together this infographic analysing all of her clothes during 2017. 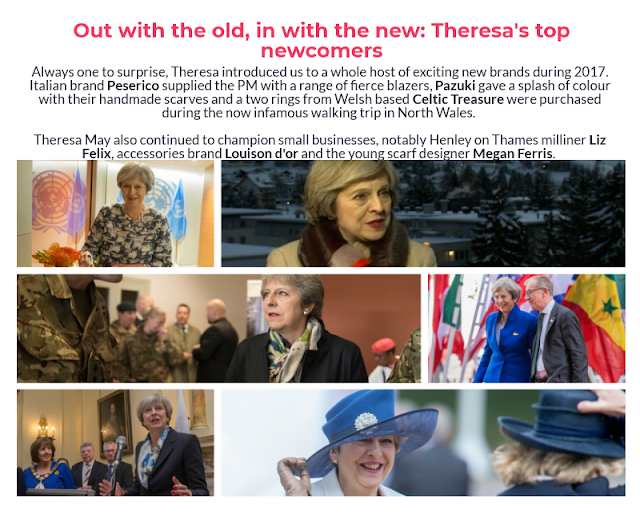 From the steps of Downing Street to her Maidenhead constituency, I've analysed the PM's favourite shoes, designers and included a few of my own favourite fashion highlights. Daniel Blake has replaced Amanda Wakeley as the Prime Minister's favourite designer. 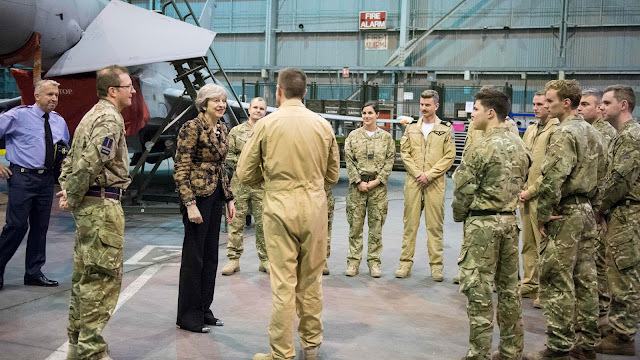 With a whole mix of jackets, coats and tailored trousers, items from British designer Blake have been worn by May a total of 51 times throughout the year. 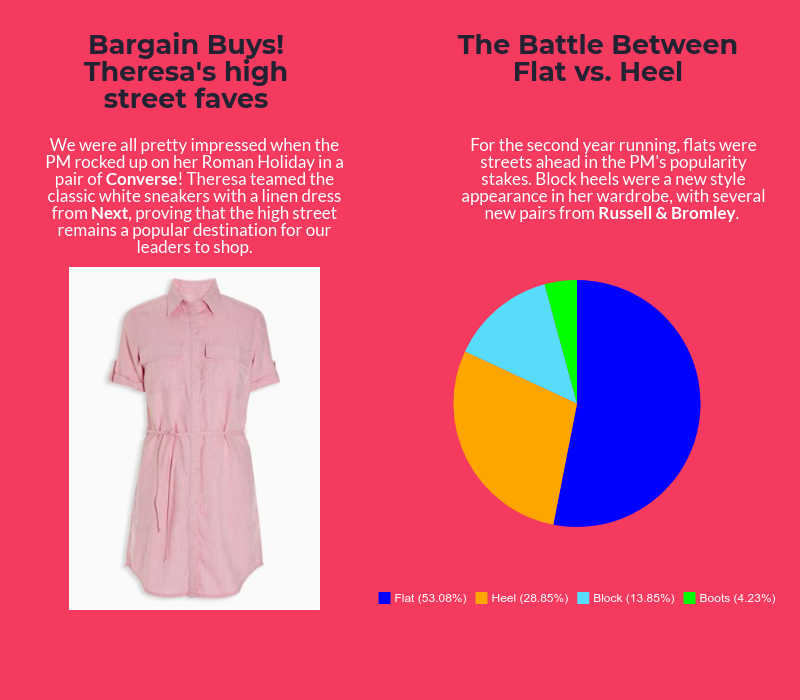 Russell & Bromley remains Theresa May's favourite shoe brand, with the high street favourite retaining its crown for 2017. The Divine jewelled flat black pump also remains May's most worn shoe for a second year running. This is closely followed by the lovely leopard Delicious flat and the sparkly Cocktail loafers. 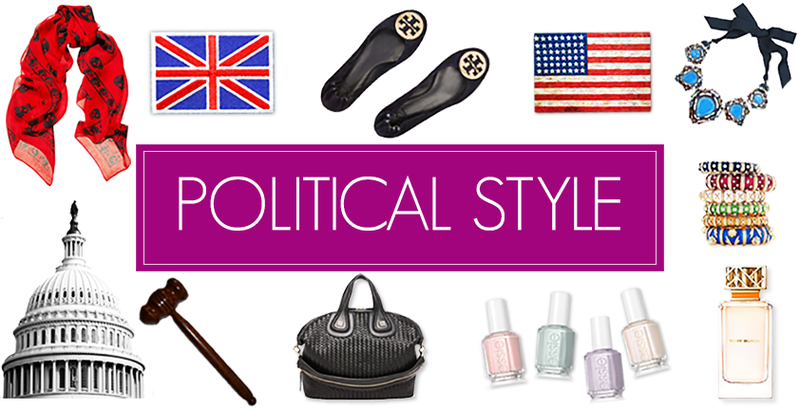 Flats also remain the PM's go-to shoe, worn by May on 53% of public appearances. Heels frequently appear when May appears at the despatch box or for speeches, providing an added boost of height. Pearls were Theresa May's favourite accessory during 2017, with a mix of simple strands and oversized versions appearing most often. 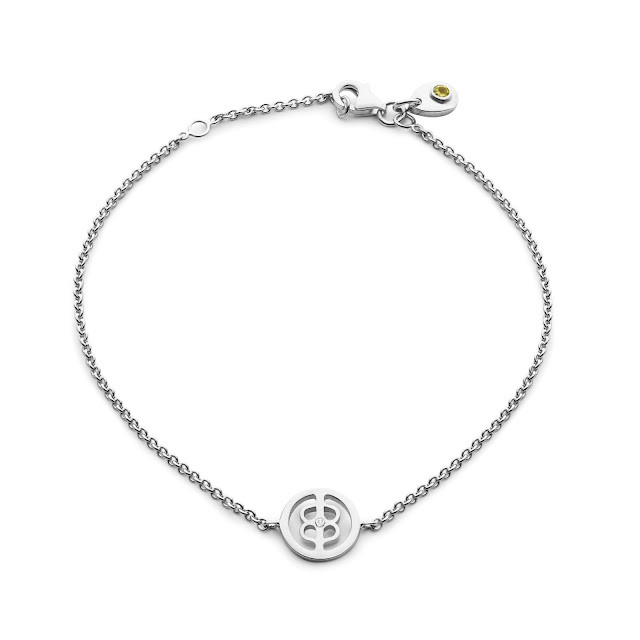 The Amanda Wakeley oversized silver chain necklace and bracelet remain a style staple, appearing 25% of the time. And what about the handbag? The newly purchased Vere satchel by Anya Hindmarch has been carried constantly by the Prime Minister over the past few weeks. From the battlefields of Iraq to the peaceful surroundings of her Sonning home, May certainly loves this luxury satchel! What surprised me about the data? We've seen a steady shift away from European designers, and a reliance on Brand Britain. 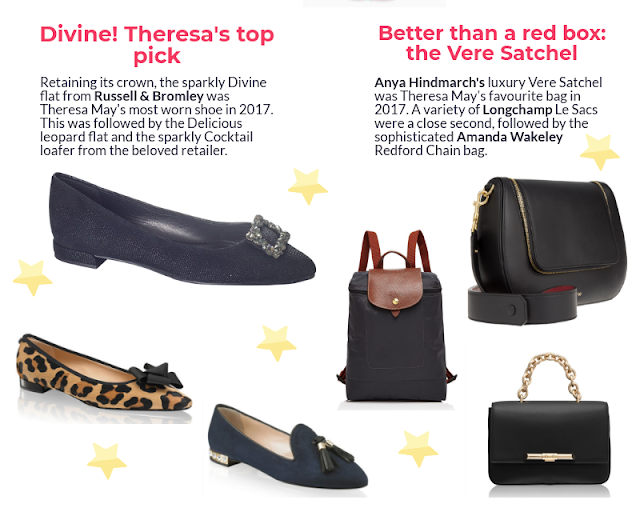 Perhaps a subtle nod to Brexit and the importance of British design, we've seen May champion designers such as Daniel Blake and Amanda Wakeley, as well as introducing new ones into the mix - such as Charlotte Olympia for a quirky take on the leopard kitten heel. 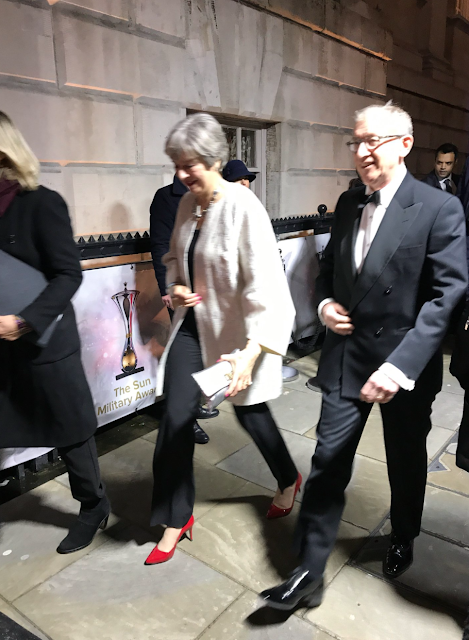 And who can forget Theresa wearing a custom made pair of Charlotte Olympia heels for Red Nose Day? I'm particularly excited to see Theresa May supporting small businesses and British traders. We've notably seen her wear a gorgeous navy and white silk scarf by young designer Megan Ferris to the spring Budget, a sophisticated faux fur collar by Louison d'or to Davos and numerous hand painted and printed scarves by Pazuki. The PM has also dug deep into her closet and re-introduced items from the past! We've seen old leopard Russell & Bromley boots on the campaign trail, a Liberty x Barbour olive wax jacket and patterned dresses from Maria Grachvogel and Amanda Wakeley all make welcome reappearances into the prime ministerial repertoire. The steady reappearance of leopard into May's wardrobe- everything leopard, all the time! Championing my homeland of Wales with two Celtic Treasure rings! 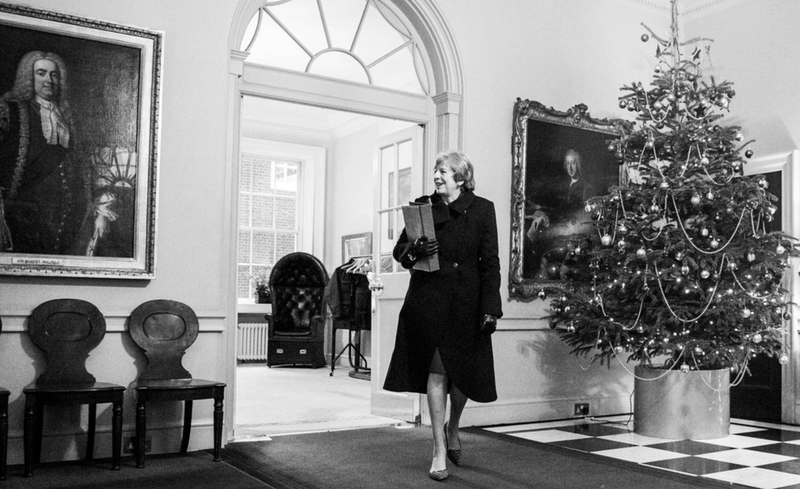 There have been so many great stylish moment from the Prime Minister this year, and her leadership and humour remind us what a role model she is- both professionally and personally. Who else could fly the flag so stylishly for Global Britain?! Here's to another fashionable year! 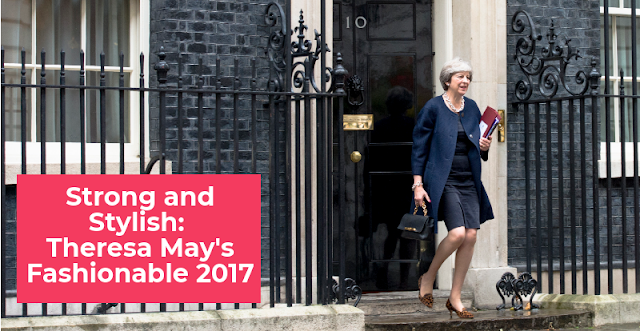 The last week of the Parliamentary term has been a busy one for the Prime Minister! 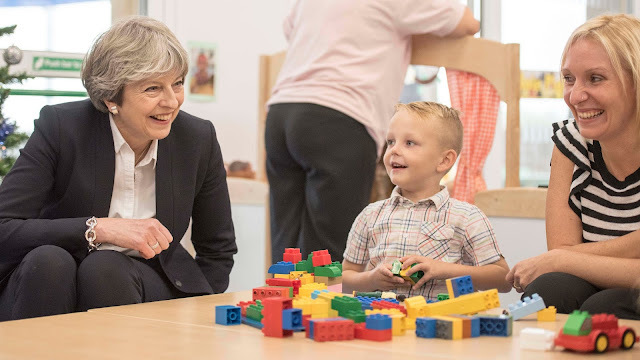 Theresa May started the week in her Maidenhead constituency, visiting Royal Mail employees at her local sorting office. 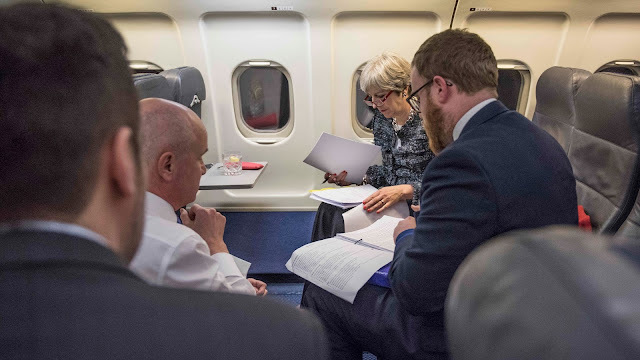 The PM then returned to London, where she updated MPs on the Brexit negotiations and recent European summit. The PM wore her new icy blue blazer with a white tee, black trousers and the Charlize steel toed loafers from Russell & Bromley. On Tuesday, May held her weekly Cabinet meeting and attended the 1922 Christmas party in the evening. May wore a tailored grey dress by Daniel Blake for the festivities. On Wednesday, the PM was on fierce form at Prime Minister's Questions. The utterly amazing electric blue Orchid jacket and matching skirt from Daniel Blake was May's choice, and she teamed it with the the leopard Kitten heels from Charlotte Olympia. Her military inspired Daniel Blake navy coat and the Vere satchel from Anya Hindmarch were the other pieces for her outfit. 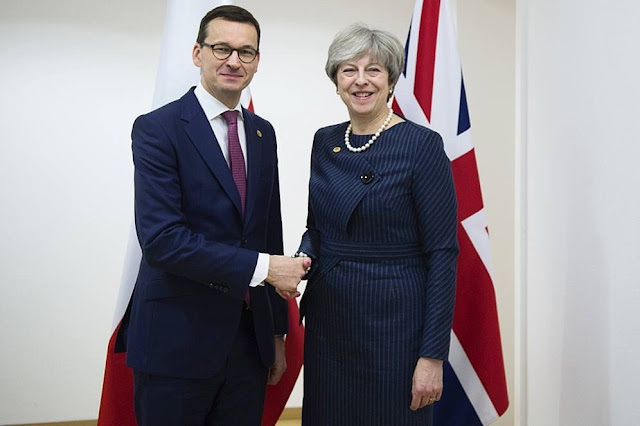 On Thursday Theresa May travelled to Poland to meet with her Prime Ministerial counterpart. 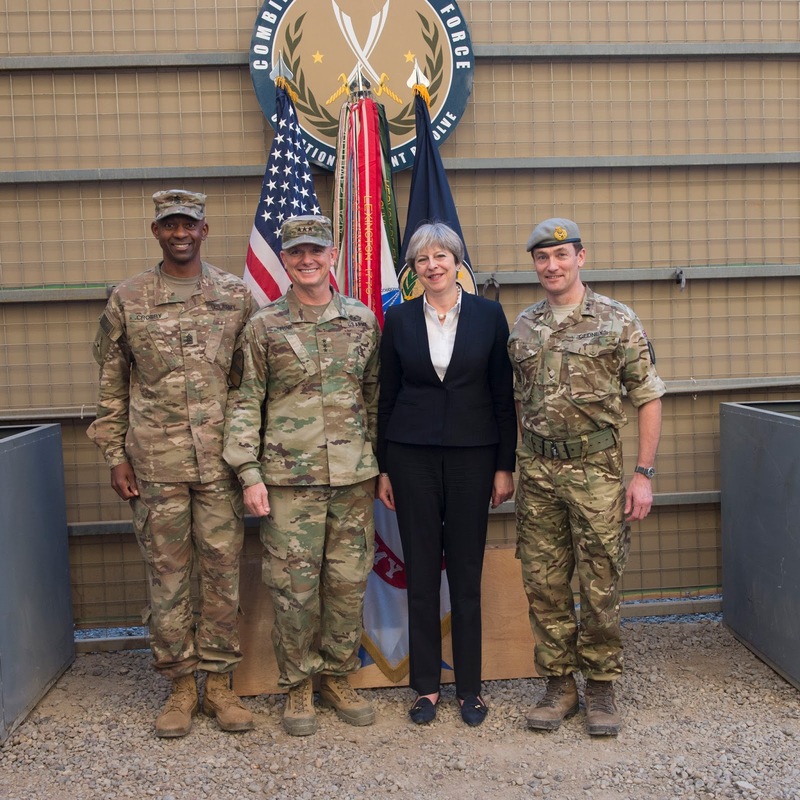 May also met with veterans and serving military members. 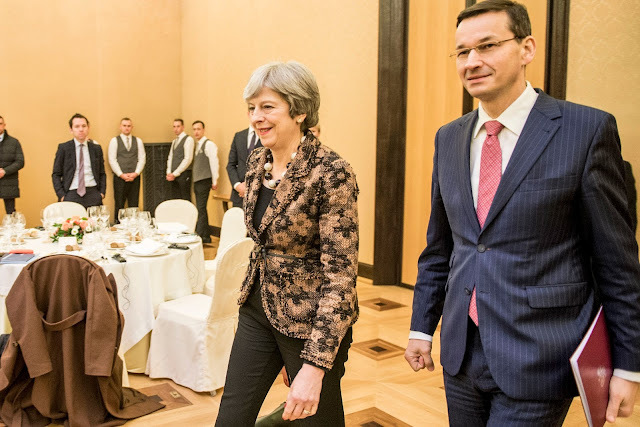 May chose the caramel floral tweed jacket by Paule Ka, black trousers, her Daniel Blake coat and the Charlize loafers for her visit to Warsaw. 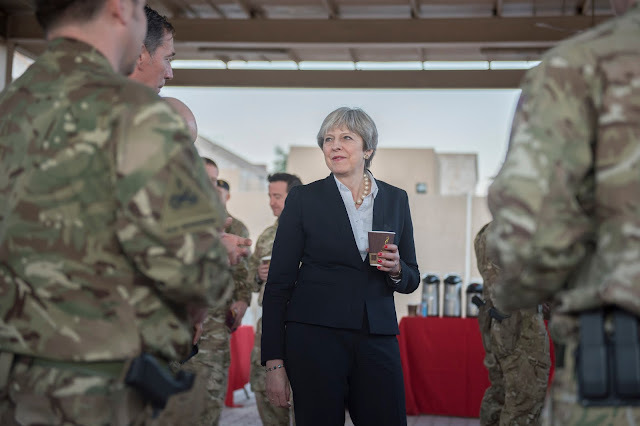 May then flew to Cyprus where she met with serving members of the British military at Royal Air Force Akrotiri. 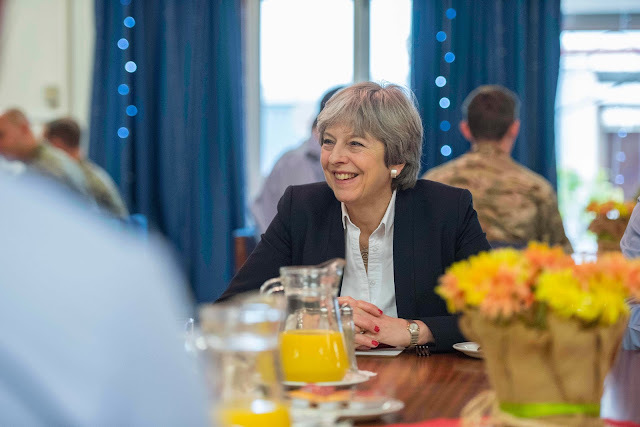 May spent part of Friday at the Base, meeting members and their families. 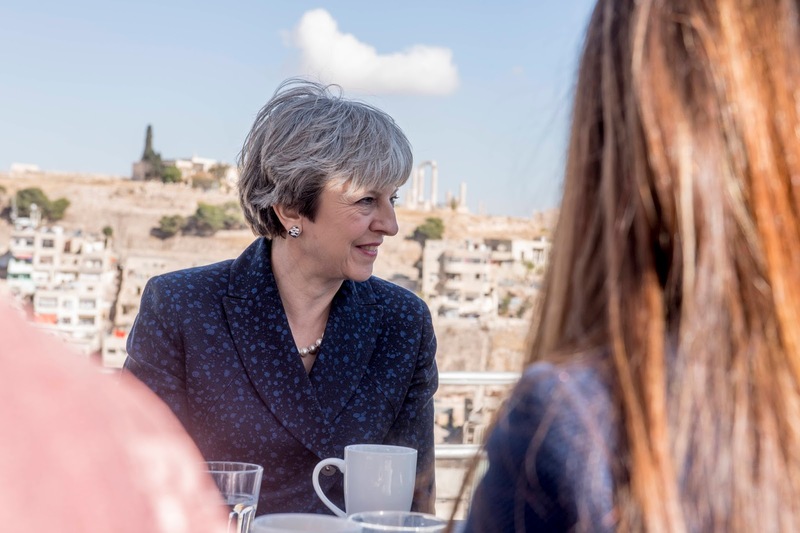 The PM wore a navy trouser suit, white shirt, accessorising with the oversized Amanda Wakeley chain bracelet, Caroline Thomson swirl necklace and the navy Cocktail loafers from Russell & Bromley. 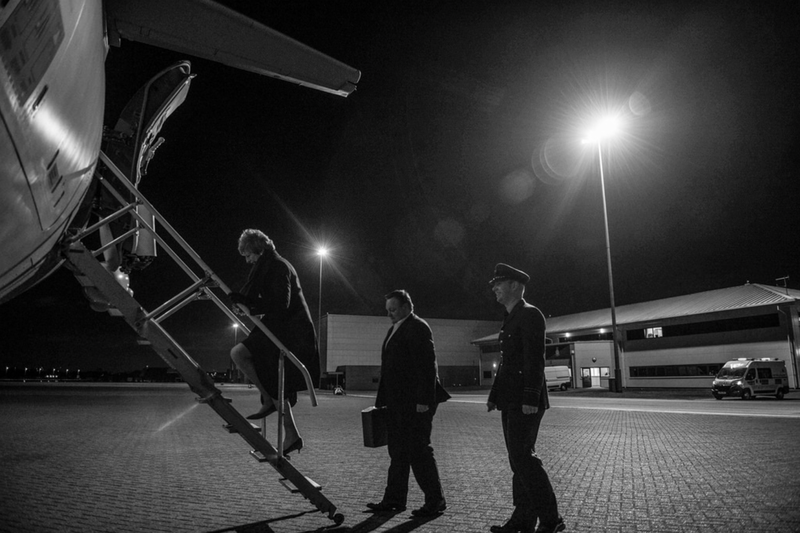 From Downing Street to Paris, here's a recap of Theresa May's week! 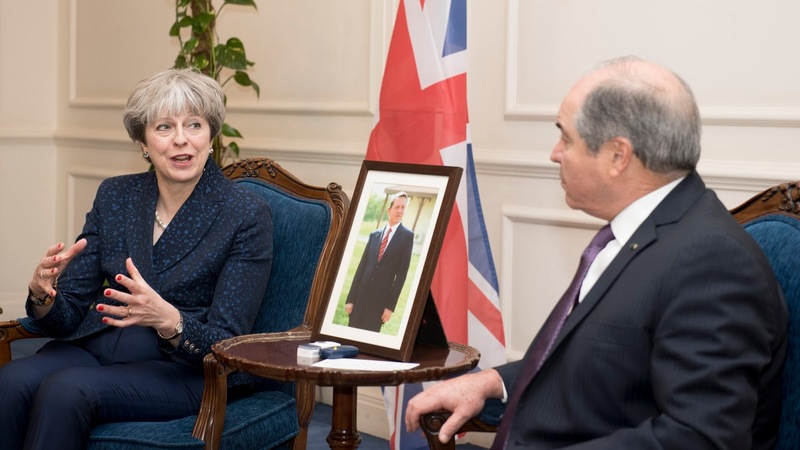 On Monday, Theresa May welcomed the Prime Minister of Bulgaria to Number 10. May wore her navy Military Daniel Blake jacket with trousers, the leopard Delicious Russell & Bromley flats and oversized pearls. 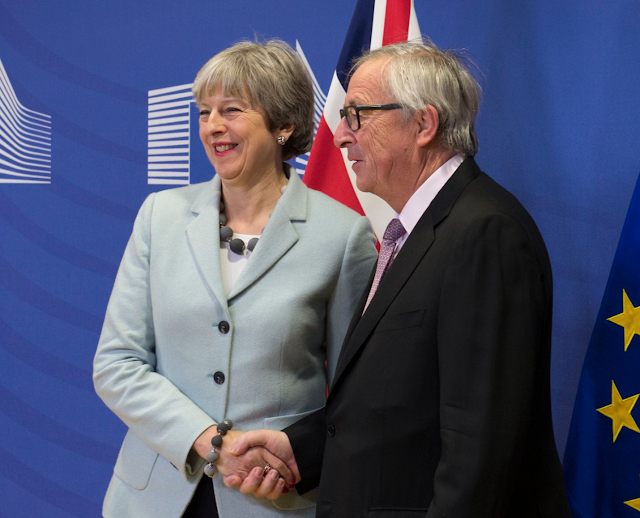 May also updated the House on the Brexit Phase 1 agreement. 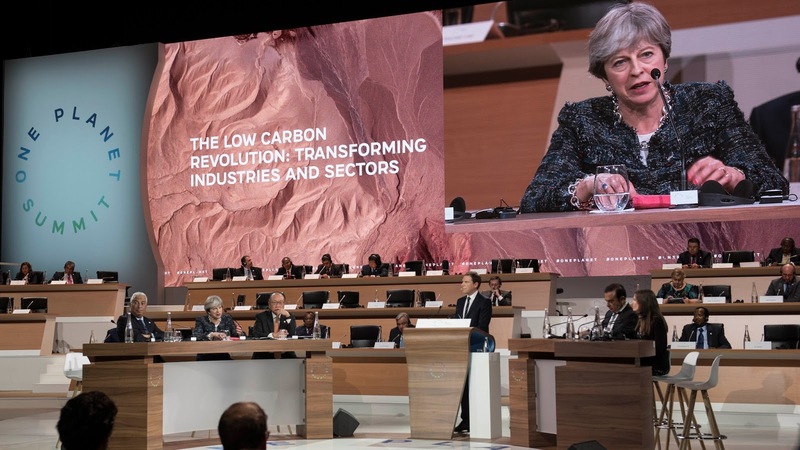 On Tuesday, the PM travelled to Paris for the One Planet Summit. Opting for the sparkly DvF tweed jacket, May teamed this great piece with trousers, the Divine jewelled Russell & Bromley flats and the oversized Amanda Wakeley chain bracelet and necklace. On Wednesday, Theresa May was back in the Commons chamber for Prime Minister's Questions. 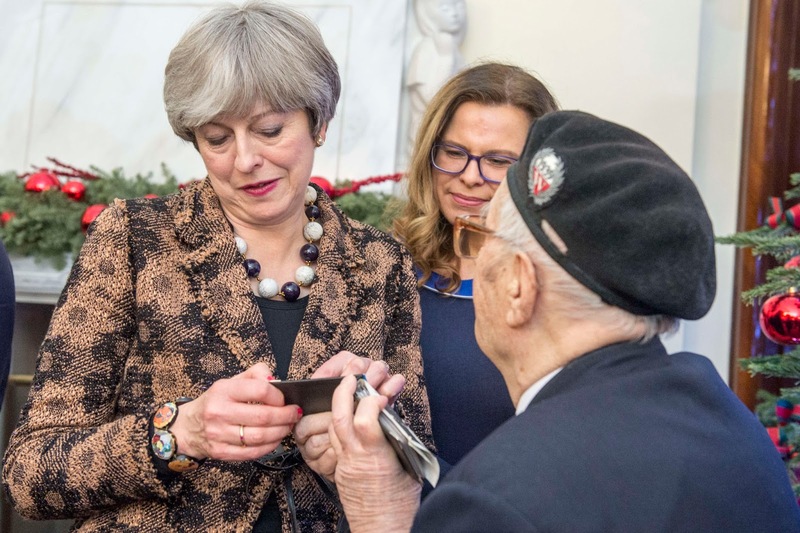 The navy satin skirt suit was back- and the PM teamed it with the festive red Link In block heels from Russell & Bromley, the Vere satchel from Anya Hindmarch and the beautifully tailored Daniel Blake black coat. Later in the day, the PM attended The Sun Military awards wearing a white and silver Amanda Wakeley evening coat with trousers, the silver lame Valorie clutch from Anya Hindmarch and red patent heels from LK Bennett. On Thursday, May attended the Grenfell Tower Memorial Service at St. Pauls. 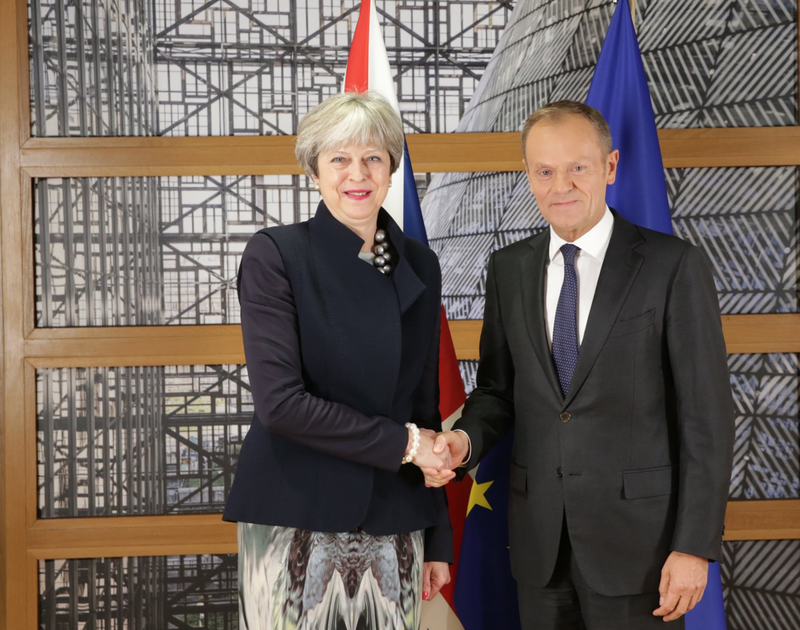 Later in the day she was back in Brussels, wearing a tailored Daniel Blake grey pinstripe dress and the Daniel Blake black coat. May also wore the Twiggy heels from Russell & Bromley and the Vere satchel. We all want our jewellery choices to empower us, and AWE's range of striking designs does just that. Three time cancer survivor, Jill Johnson founded AWE Alive We’re Empowered in 2016. 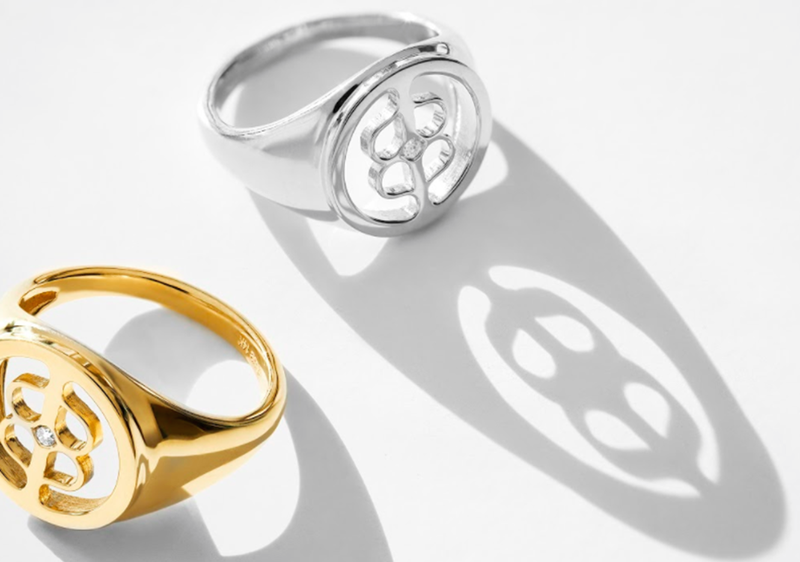 She relied on her 27 years as a sought-after importer, manufacturer and wholesaler to the jewellery trade to design a beautiful and meaningful jewellery collection that could empower—and unite—a larger community. 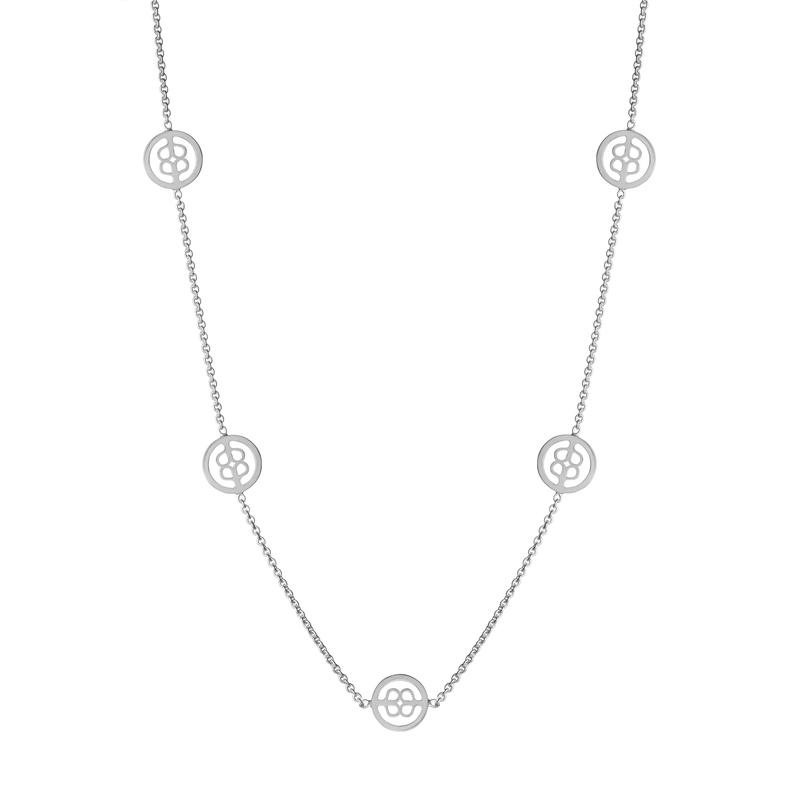 The AWE medallion’s message of strength, hope and resilience is an expression of Jill’s personal journey as well as a tribute to those who have inspired her along the way. who save lives and help those in need. My favourite pieces from the AWE Everyday collection are the Mini Medallion Bracelet, the Mini Diamond Medallion Ring and the Transformation Necklace. Delicately beautiful, these AWE pieces are perfect to wear everyday and be part of your staple look. Jewellery is always personal, and should give you the confidence and empowerment to embrace your own look and style. AWE's pieces do just this. An item from AWE is the ideal gift for friends and family this Christmas, and one which will stand the test of time. I can't wait to wear my selections! 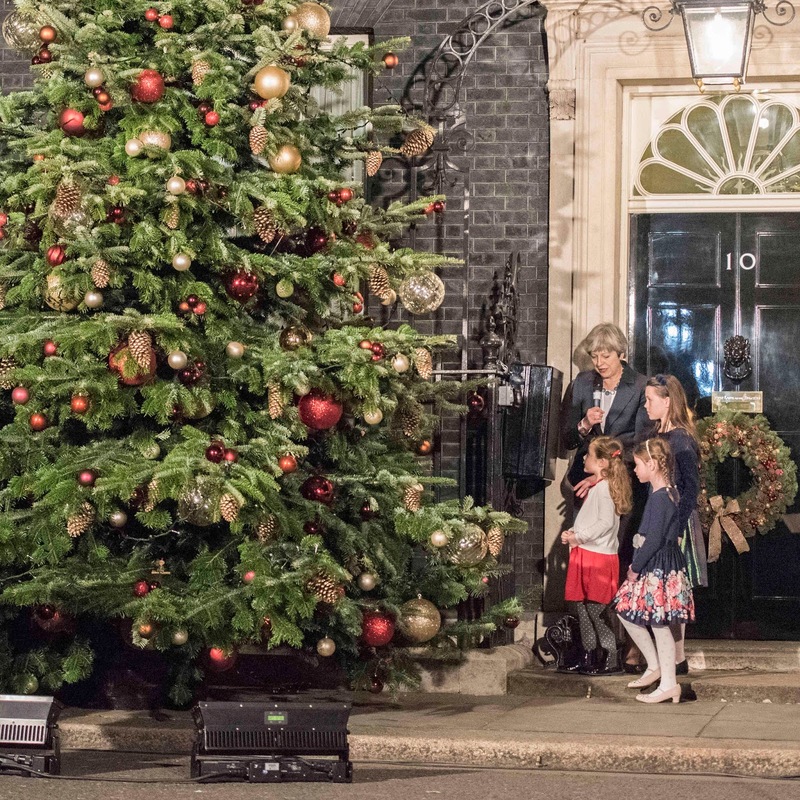 From Brussels to the official lighting of the Downing Street Christmas tree, here's a recap of Theresa May's week. On Monday, the PM was in Brussels for continuing Brexit talks. May wore a printed navy and white dress by Maria Grachvogel, teaming it with a two textured navy blazer and the Twiggy kitten heels from Russell & Bromley. She accessorised with the silver Balls necklace from Mirta Bijoux. 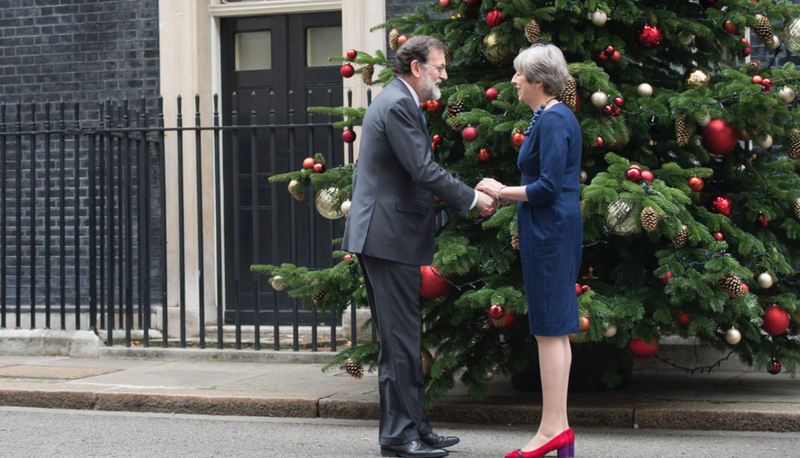 On Tuesday, Theresa May was back at Number 10 to welcome Spanish Prime Minister Rajoy to London. May wore the navy check Tulip dress from Daniel Blake, accessorising with her navy Mirta Bijoux Balls necklace and the crystaldust Swarovski bangles. The PM revisited one of her new shoe purchases - this time, the vibrant red and purple Link In block heels from Russell & Bromley. 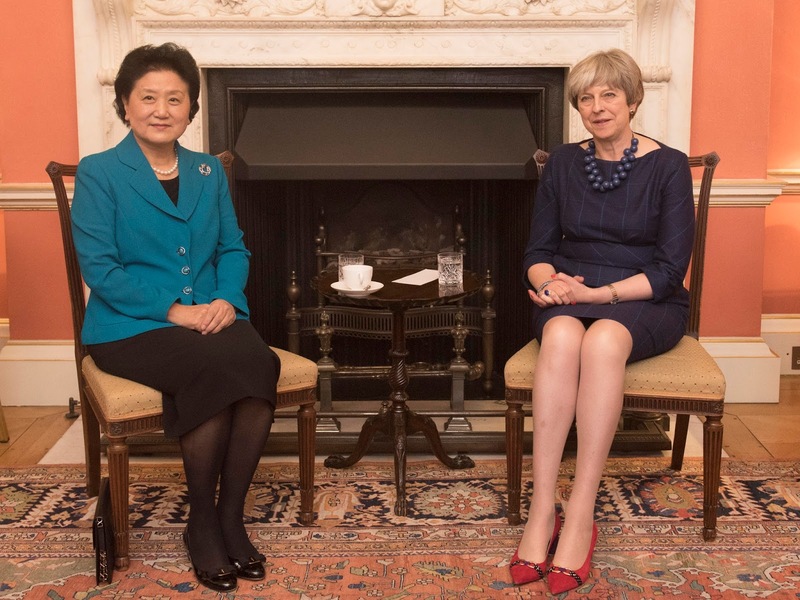 Later in the day, the PM welcomed Liu Yandong, Vice Premier of The People’s Republic of China to Number 10. 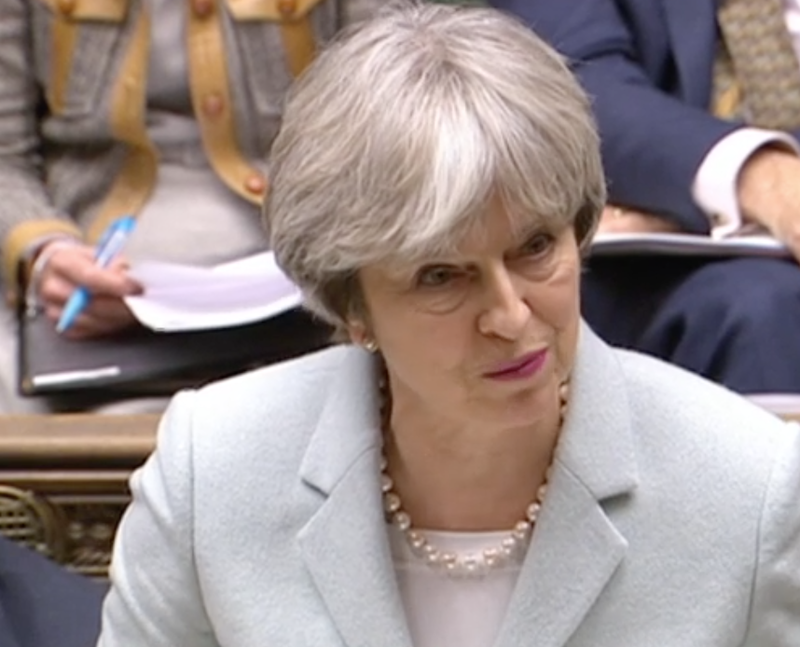 On Wednesday, Theresa May took part in the weekly Prime Minister's Question slot in Parliament. 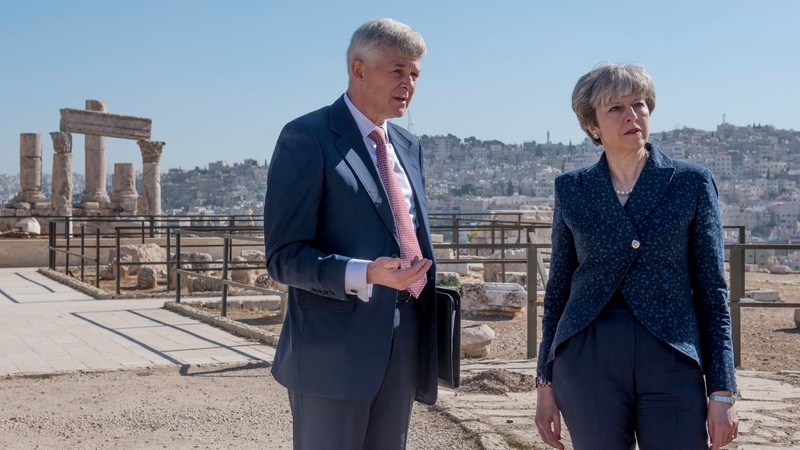 It was back to the familiar navy Escada suit for her appearance at the despatch box, with our favourite leopard Kitty heels from Charlotte Olympia once again on show! May also accessorised with a green oversized jewel necklace and the Vere satchel from Anya Hindmarch. 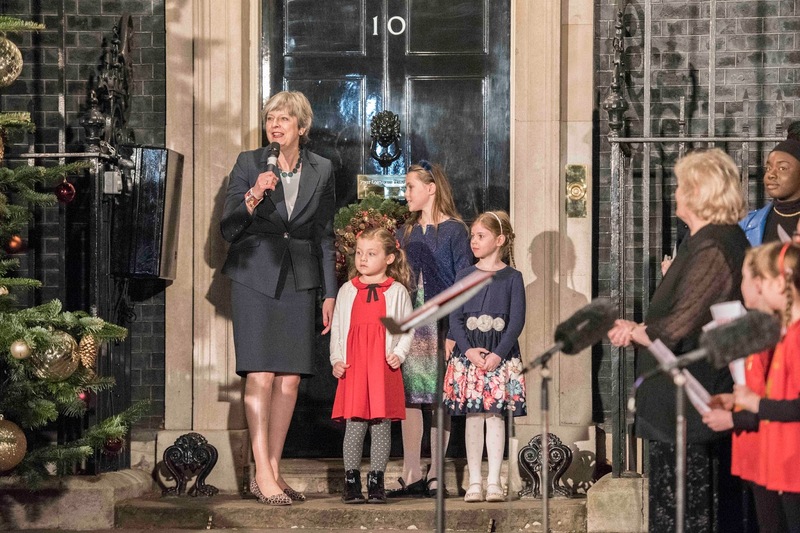 And on Wednesday afternoon, the PM switched on the Downing Street Christmas lights with the help of her Christmas card winners from Maidenhead. A super sparkly and gorgeous tree this year! 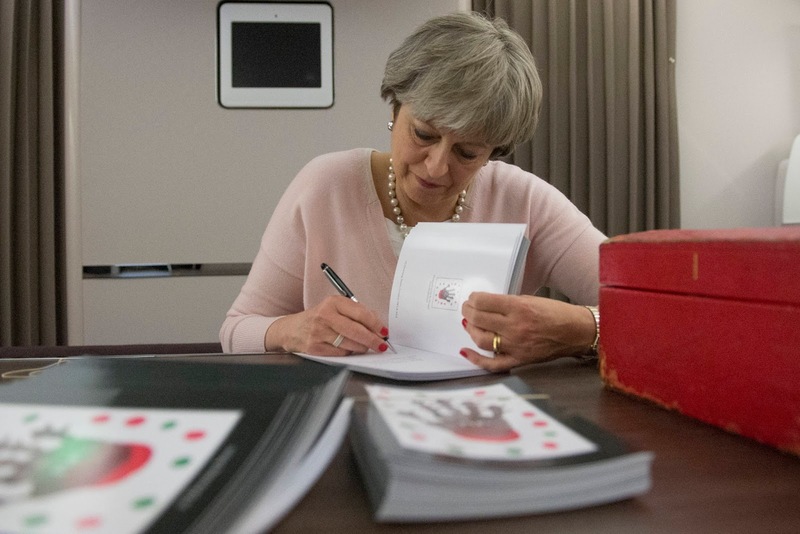 On Thursday, the PM was hard at work signing her Christmas cards in this official Number 10 photo. And on Friday, Theresa May headed to Brussels in the early hours of the morning to formally announce that Phase 1 of the Brexit negotiations was complete. 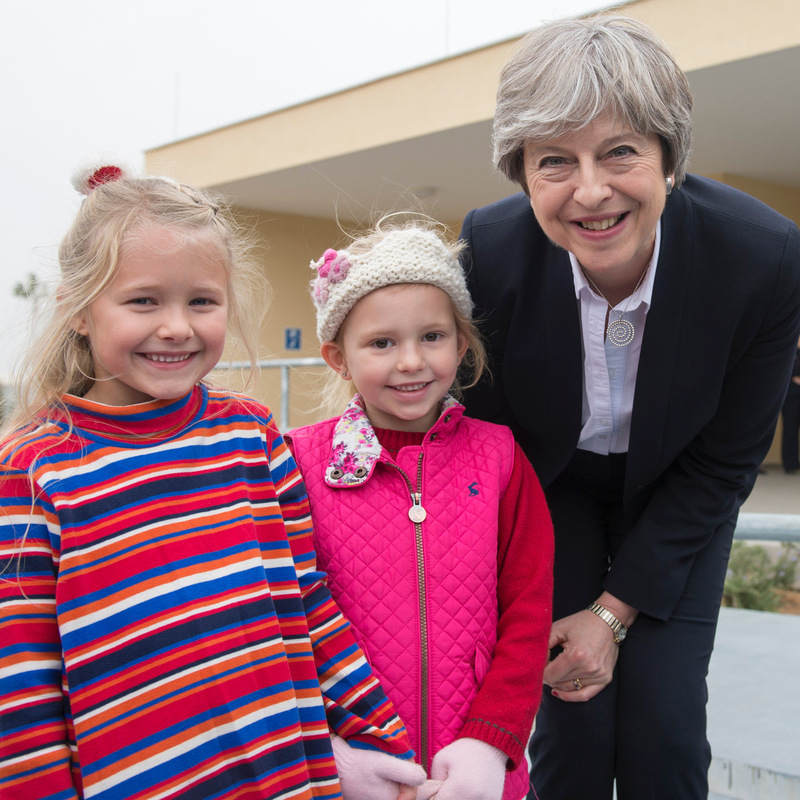 It was a no fuss outfit for the PM, with May turning to a simple navy skirt and light blue blazer with her leopard Kitty Charlotte Olympia heels for the announcement. 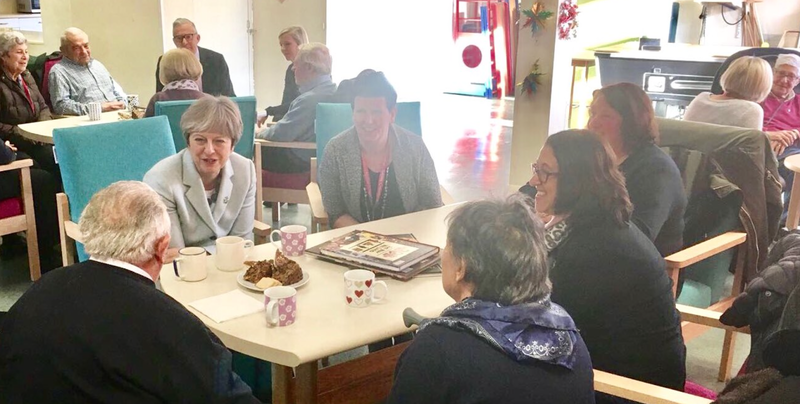 May headed straight back to her Maidenhead constituency to visit a Dementia Friends project- strong and resilient is our amazing PM! 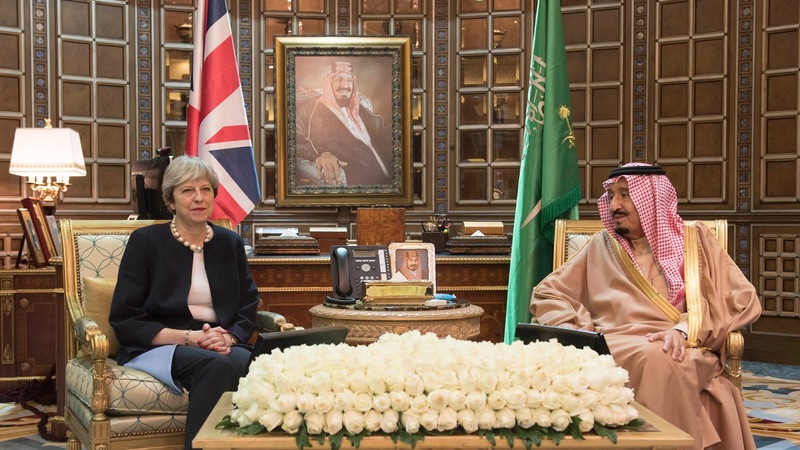 Meetings at Number 10 and a trip to the Middle East- here is a recap of Theresa May's week! 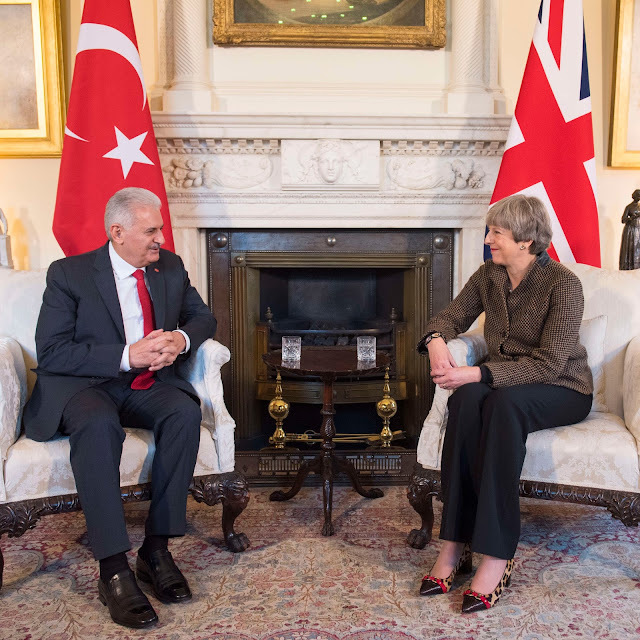 On Monday, the Prime Minister welcomed the Prime Minister of Turkey to Number 10. 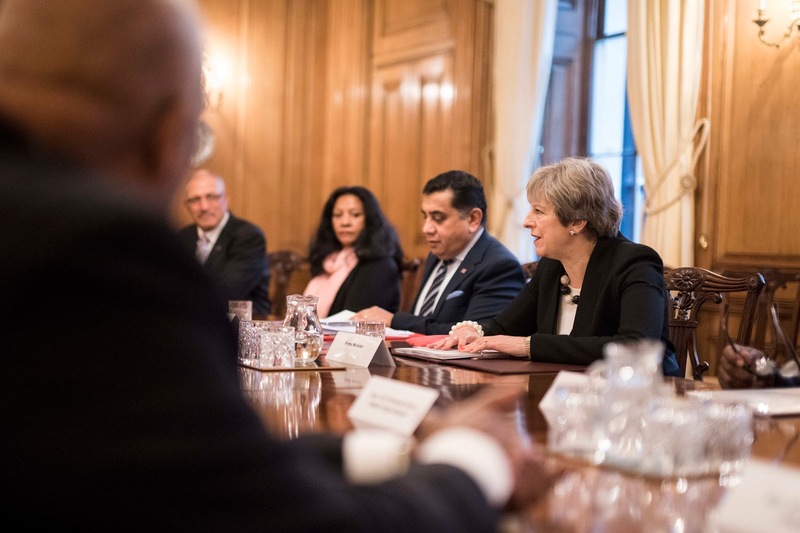 For this meeting, May wore a brown textured check jacket, black trousers and the leopard Link In block heels from Russell & Bromley. 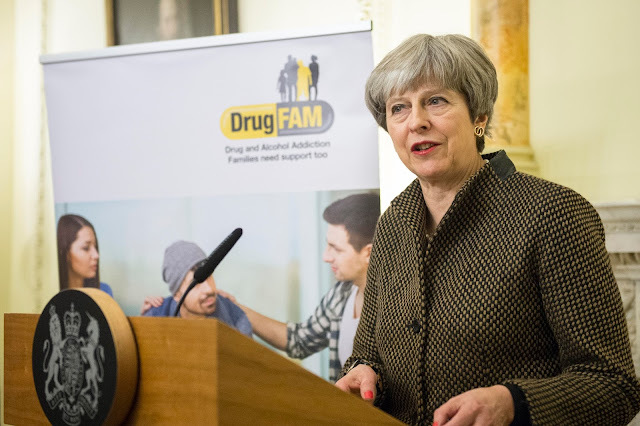 Later in the day, May hosted a reception for Drug Fam at Downing Street. On Tuesday, May met with leaders from British Overseas Territories to discuss funding for natural disasters, such as the recent tornados and tropical storms. May wore a black and white suit, accessorising with her new black and white oversized bead necklace. On Wednesday, Theresa May visited Iraq on an unscheduled trip. She is the first major world leader to do so since the fall of Mosul. 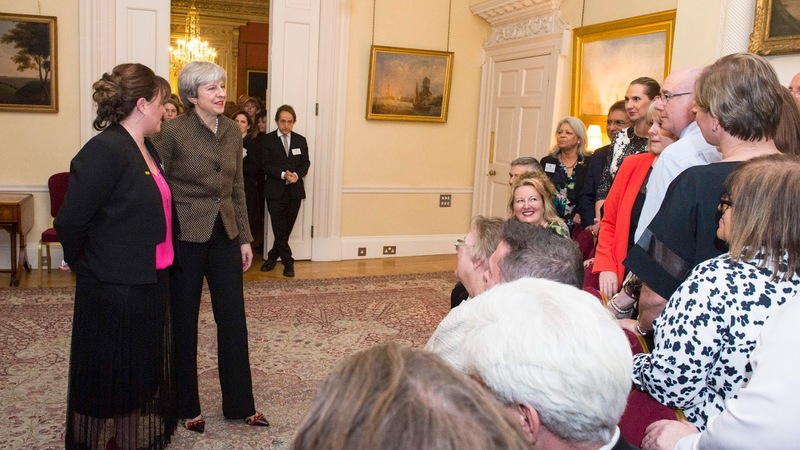 May wore a suitably practical dark suit, with the Cocktail loafers from Russell & Bromley - before changing to sturdy shoes! She also took her new Vere satchel from Anya Hindmarch. 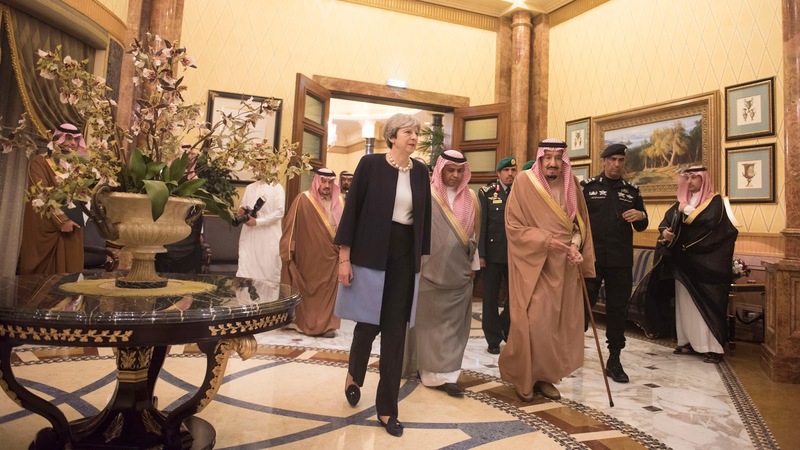 Later in the day, May travelled to Saudi Arabia, visiting King Salman. 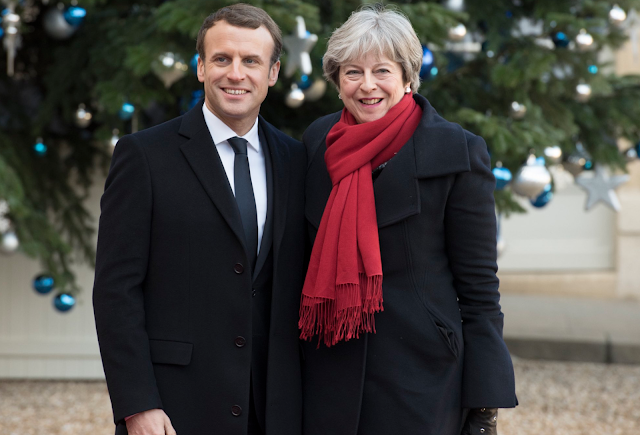 May wore a navy and sky blue coat from Amanda Wakeley, accessorising with oversized pearls and the Cocktail loafers. 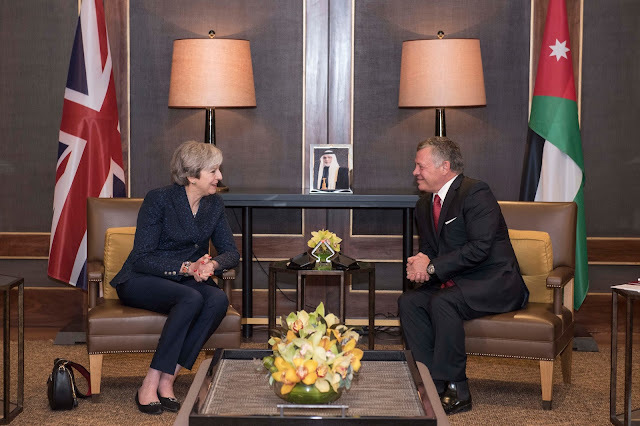 On Thursday, May travelled to Jordan, meeting with King Abdullah. 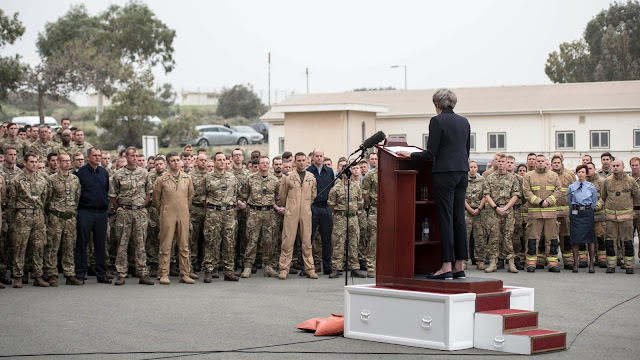 May wore the navy Daniel Blake military cut jacket with trousers, opting for the Divine flats from Russell & Bromley, pearls and the Vere satchel. Later in the day, she also met with women benefitting from the Arab Empowerment Fund.